Bright Blessings, Everyone! Well, it's almost the Wiccan New Year!!! Happy Samhain! (October 31/Halloween, for those who didn't know). Time for rituals, trick-or-treating, and gatherings of pagans all across the country! Pretty soon, I'll have all of my rituals for each Sabbat up & running, so you won't have to wait for the Sabbat to get the ritual. :) I'm also going to try to make them available in .pdf format so you can download & print them for your own use! Thank you for visiting, and have a magickal Hallowe'en! 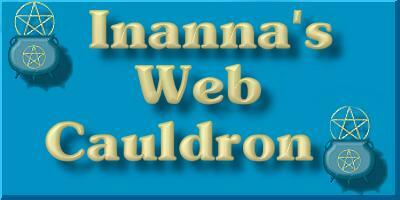 Merry Meet and welcome to the Web Cauldron! Do you have a new baby in the family? Check out my Wiccaning Ritual. Or, expand your pagan knowledge and have some fun learning how to make a musical instrument page. If you'd like to get a copy of other rituals, please e-mail me. Wondering what in the world "Wicca" is? Visit the What is Wicca page. Does the seasonal temperature change have you feeling "under the weather?" Stop in and visit my aromatherapy page! Wondering who I am? See the Inanna page. In case you're wondering what my feelings are on being a Wiccan and a parent, read over this commentary. Feel free to share your thoughts. I've also included a few Links and Webrings for your surfing pleasure. If you're searching for information about specific Gods and Goddesses, check out the Encyclopedia Mythica. Thanks for stopping by! Please feel free to sign my guestbook or e-mail me if you have questions or comments. NOTE: To all who enter: This site discusses Wiccan topics. In my tradition, I work by the rule of three - Whatsoever you do, shall come back to you, threefold. Therefore, An' it harm none, do as ye will. See how your rights as a Wiccan/Pagan with a website are being violated, and what you can do about it! This site last updated on: October 12, 2003.